Looking for heart themed favors that make the most of elegance and style? Well, look no further! This Fashioncraft exclusive favor set features two 3¾" square glass coasters tastefully adorned with a stunning black and white pattern of hearts and decorative flourishes. Each has a 2.75" x 2.125" photo window at its center for easy insertion of a photo or event day message/seating assignment. 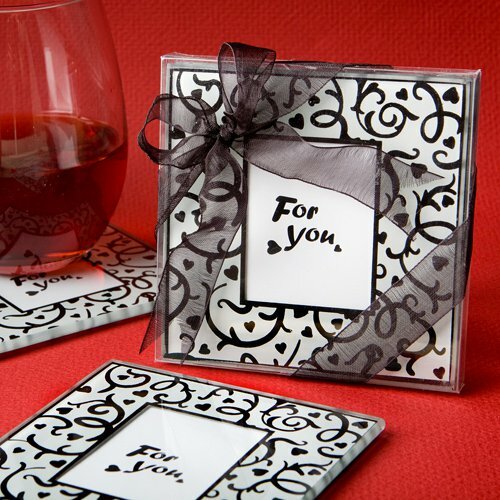 Sure to delight as love themed favors with a lot of heart, these Hearts and Flourishes Collection coasters come in a clear acetate display box tied with a black organza ribbon and a heart enhanced "For You" message displayed in the window.